Turkey has some similarities with the Asian crisis countries back in the 1990s, but also important differences. When emerging-market crisis typologies are updated to reflect the events of 2018, Turkey should enter into the pantheon on its own, not just as a sub-category of “Asian-style” crises. One emphasizes the foreign currency borrowing of Turkey’s companies, who will struggle to repay their foreign currency loans at the current exchange rate. That certainly has a large element of truth to it. Turkey's firms have around $335 billion in foreign currency debt, and it seems that a number of the firms that took out foreign currency loans don't really have natural hedges. * There will be a lot of quiet restructurings, and probably a few noisy defaults. Another puts the emphasis on loose fiscal policy, typically in a narrative centered around the 2018 elections and Erdogan’s desire to spur the economy as he sought to consolidate his current dominant political position. That to be honest isn’t my favorite framing, even though Erdogan did use fiscal policy to give Turkey’s economy a jolt before this year's election. The IMF believes there has been a structural loosening of fiscal policy of over a percentage point of GDP since 2016 (see table 1 of the staff report), and, that measure leaves out the credit boom generated by last year's government guarantee fund for small business lending. Yet Turkey’s fiscal deficit is significantly smaller than its current account deficit—and the government itself hasn’t been a huge borrower in foreign currency. Even with the recent loosening, the fiscal deficit is around 3 percent of GDP and the fiscal debt is around 30 percent of GDP. Turkey isn’t Argentina. I think the emphasis should be on Turkey’s banks, and their large stock of external debt. The banks are the main reason why Turkey's currency crisis could morph into a funding crisis, one that leaves Turkey without sufficient reserves to avoid a major default. The common analogy used here is Asia. Back in 1997 and 1998. Most emerging Asian countries didn’t have big fiscal deficits. But they did have current account deficits. Those current account deficits were financed heavily by short-term cross border bank lending, a form of financing that is notoriously prone to runs. The Asian banks then took funds raised abroad and lent them internally in dollars—often to real estate companies. When the music stopped, the world’s banks realized that they had lent a lot of dollars to banks in countries that had far more short-term debt coming due than they had liquid foreign currency reserves. Turkey seems to fit the same bill. Current account deficit financed by external borrowing. Check. Total external debt is now $450 billion, short-term debt (on a residual maturity basis) is well over $150 billion. Lots of external borrowing by the banks. Check. Lots of external debt denominated in foreign currency. Check. Lots of domestic bank lending to firms in foreign currency. Check. Limited reserves. Check. The IMF’s (somewhat flawed, in my view) reserve metric lets Turkey get away holding fewer reserves than it has short-term debt, and Turkey still doesn’t pass muster. But while Asia offers the best parallels, the analogy to Asia is also just a bit off. 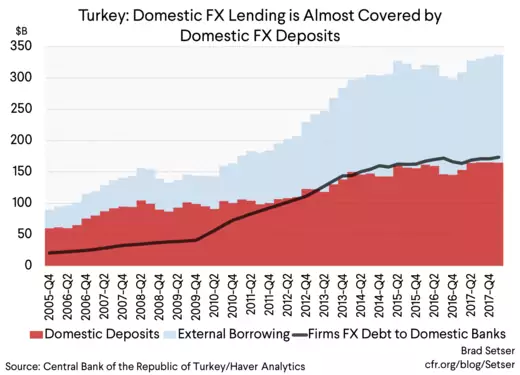 Turkey has, rather miraculously, been able to use external foreign currency funding to support a domestic boom in lira lending to households… something Asian banks never did, to my knowledge. There are a couple of important things to note here. First, Turkey’s banks really didn’t need to borrow foreign currency from the rest of the world to support their current level of foreign currency lending to Turkey’s firms. Domestic foreign currency deposits ($165 billion, best I can tell) are about equal to domestic foreign currency loans to firms ($155 billion). The banking system—counting deposits from non-residents—actually has slightly more foreign currency deposits than it does loans. Third, the real boom in credit has come not from foreign currency lending to firms, but rather from lira lending to households (for mortgages, and for “installment” loans to buy things like appliances). The answer to that mystery is both straightforward and complex. But by holding all of their equity in lira even though a large part of their funding and lending was in dollars, the banking system's capital ratio falls as the lira falls (see the FT). That’s why the central bank is letting the banks use the end June levels of the lira to assess their capital needs. The banks have a bit of "wrong way risk" in their capital structure: their capital levels mechanically fall just when the banks are likely to need capital. The result is that Turkey's banks have a maturity mismatch on their lira book. They will start taking losses quickly if domestic interest rates rise too high, as they have longer-dated lira loans and shorter-dated lira funding. And two, the central bank facilitated the banks’ alchemy by letting the banks post foreign currency (and gold) at the central bank to meet their lira reserve requirement. That’s the infamous reserve option mechanism (ROM), which in effect substitutes for swap funding from the market (as the CBRT itself recognized back in 2013). * Banks had the option of meeting their reserve requirement in lira or in foreign currency. And they took advantage of that option. Dollars (and euros) could be borrowed cheaply and delivered to the central bank. And then the banks could lend out more lira at a high rate. It was a big carry trade, facilitated by the regulators (the reserve option mechanism also helped Turkey rebuild its headline reserves back in 2013 and 2014). In aggregate the banks have just over $150 billion in domestic foreign currency deposits, and just over $150 billion in external foreign currency liabilities—total foreign currency liabilities top $300 billion, and most are fairly short-term (the banks also have placed over $30 billion in bonds abroad in the last five years, with some of those bonds now starting to mature). The aggregate currency balance sheet of the banks is about $100 billion larger now than it was at the end of 2012 (e.g. heading into the taper tantrum). That's the liability side. What is there on the asset side that matches the $300 billion in foreign currency liabilities? Just over $150 billion in domestic foreign currency loans to firms (mostly long-term). The CBRT's data here is great. But that leaves another $150 billion or so. Some of the banks' spare foreign currency has been invested in the government’s foreign currency bonds. Some is held on deposit abroad (perhaps as part of the swap arrangements?). The net international investment position data shows that the banks had $25 billion in offshore foreign currency deposits at the end of q1. And some is held on deposit at the central bank of Turkey to meet the banks' reserve requirement on their dollar funding and, thanks to the reserve option mechanism, the banks' lira reserve requirement. The banks have lent about $60 billion in foreign exchange and gold to the central bank (that is disclosed on the central bank’s reserve disclosure as a short-term drain on reserves). 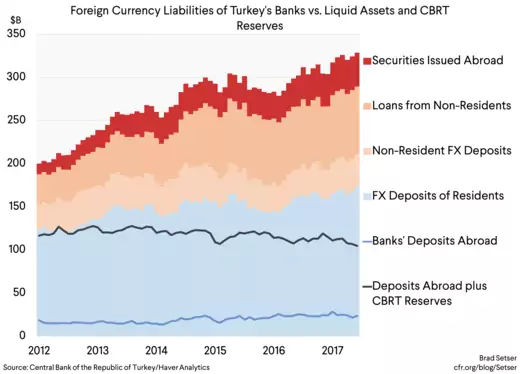 Yet even with these liquidity buffers, the banks’ foreign currency liabilities now pose the biggest structural risk to Turkey’s financial stability. They create a subset of problems that Turkey potentially cannot manage on its own. Firms with too much foreign currency debt can be allowed to go bankrupt: they need not be a direct drain on reserve. Of course, firms desire to hedge (through the purchases of foreign currency) can still put pressure on the currency and fuel a downward spiral. And letting important firms go bankrupt has consequences for bank capital. But the banks' losses on their domestic foreign currency lending can be met by writing a check to the banks to cover their recapitalization costs. That alone won’t force Turkey to the IMF. However, if foreign creditors won’t renew their maturing external loans to Turkey’s banks—or if domestic depositors holding foreign currency deposits run—Turkey’s banks will eventually run out of dollars. It is just a matter of time. 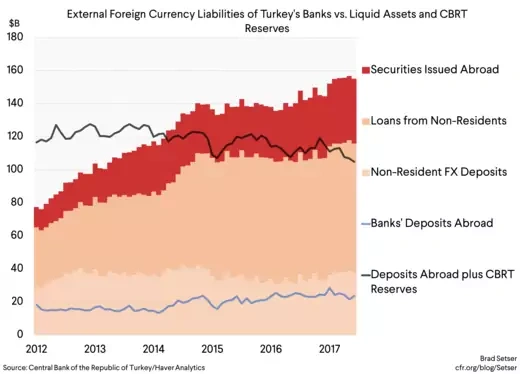 Yet ironically even if the banks are intrinsically vulnerable to a run because they have far more short-term foreign currency liabilities than liquid foreign currency assets, they also have one of the largest stockpiles of foreign currency liquidity in Turkey. The banks' liquid foreign currency assets—both deposits abroad and reserves held at the CBRT—total over $50 billion. And since the CBRT doesn't have many reserves of its own left, allowing the banks to reduce their foreign exchange holdings is one of the levers that the central bank can use to try to support the lira. That’s one of the many things that the central bank and the regulators seem to have done last weekend to try to shore up the lira. One, the Turkish banks’ foreign currency liquidity position has eroded since 2012. Even if all the CBRT’s foreign exchange is considered to be a part of the bank’s liquidity buffer, there isn’t enough foreign exchange in the banks and the central bank to cover the banks’ external foreign currency debts, let alone the banks' domestic foreign currency deposits. Look at a plot of the banks' external liabilities relative to the banks foreign currency deposits abroad and the foreign exchange reserves of the central bank (the black line). Two, the real boom in cross border lending to the banks came several years ago. In the last 18 months or so Turkey has been funding—or trying to fund—its external deficit with portfolio inflows. When those flows fell off relative to the current account deficit, Turkey tried to plug the gap by reserve sales. But at the end of the day, a gap pretty clearly has opened up between Turkey's external deficit and the available supply of net new funding. Rising dollar interest rates have reduced the incentive to search for yield in emerging economies. 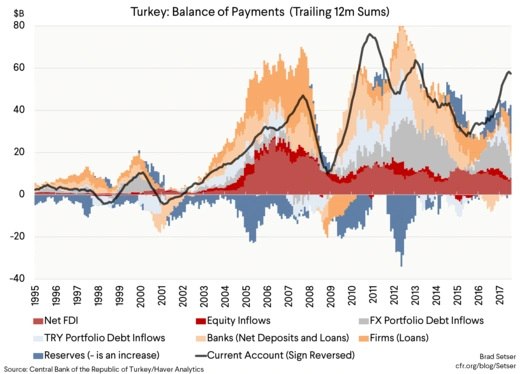 Yet even if the proximate cause of the fall in Turkey's lira was a fall off in portfolio inflows, the legacy of past bank inflows—the large stock of claims—remains. But I didn’t make it up—the role of swap funding is discussed in the central bank’s financial stability report, and the basic mechanics of the reserve option mechanism are well documented. Simple—from a balance sheet point of view, the risk of a run on the banks' foreign currency funding poses far larger vulnerabilities than the government's funding need. The government, excluding the state banks, has almost $100 billion in external debt, but less than $10 billion coming due in the next year. The banks have just over $150 billion in external debt, but over $100 billion coming due over the next year. Yet there is a still a chance that Turkey can muddle through. Its creditors have historically been sticky. If they rollover their external loans, Turkey can survive with less foreign currency in reserves than its government and the banks have in foreign currency debt coming due…especially if the fall in the currency together with new limits on domestic credit expansion bring the current account deficit down quickly. 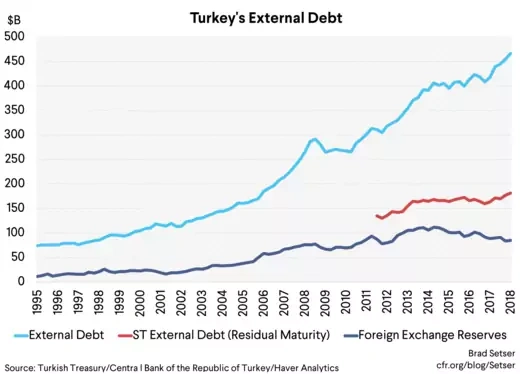 But I would bet that the dynamics in Turkey get worse before they get better—in most crises, creditors want to reduce their exposure, not just stop adding to it. The underlying risk of a severe crisis, one marked by systemic defaults not just an epic depreciation, remains. * David Gauthier-Villars of the Wall Street Journal provided useful reporting on the nature of Turkey's domestic foreign currency debt over the weekend. One firm went bankrupt because its rent payments are indexed to the dollar, creating a FX linked payment that in theory matched the FX loans of the owner of the shopping mall. Turkish Telecom also has large dollar debts, though it has at least some true foreign currency revenues. I think many of Turkey's domestic energy companies were also able to borrow heavily in dollars, because in theory they could pass along higher energy prices to their customers through dollar linked pricing. These kinds of domestic hedges that hinge on the imputed ability of a borrower to index domestic revenues to the dollar are far less strong than the natural hedge provided by export revenues. ** "Thus, the ROM induces banks to voluntarily accumulate FX at the central bank, reducing their dependence on currency swap contracts, which have been commonly used to convert banks’ FX funds into the TL liquidity, used to extend domestic loans. Instead, banks effectively “swap” FX into lira with the central bank as a counterpart." From the IMF's 2013 selected issues paper on Turkey. *** Table 4 of the IMF's latest staff report on Turkey is sobering. In both 2018 and 2019, Turkey's overall external financing need was projected to top $225 billion. The 2019 current account deficit will be smaller than the Fund forecast, but that only helps so much: the bulk of the financing need stems from the large stock of external claims that need to roll. Lenders to Turkey historically have tended to stick around even during times of stress. But the five year bonds that Turkey issued back when dollar rates were low are now starting to mature, and are unlikely to be renewed. And some one year and one day syndicated loans may not roll as well.